3 Bedroom Mews House For Sale in Salisbury for Guide Price £350,000. 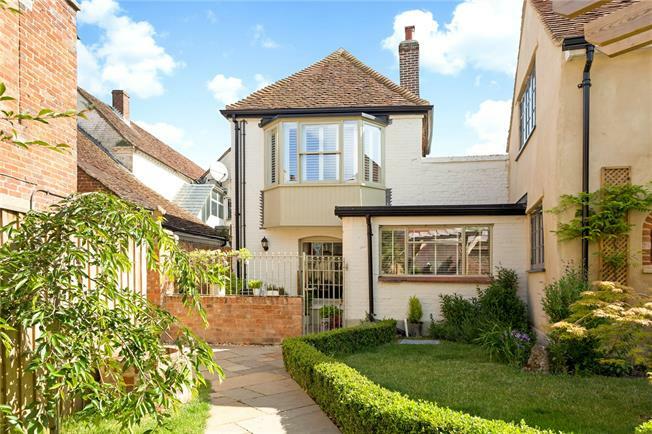 The House is a truly exceptional Grade II listed residence discreetly positioned within an exclusive collection of homes, conveniently nestled in a private oasis within the historic town centre of Wilton. This glorious, deceptively spacious period home was restored and reimagined in 2017 by local reputable builders. The deceptive home offers an abundance of versatile space that belies its external façade. The beautifully presented accommodation has been meticulously maintained with great attention and care having been paid to retaining and promoting the original character features in all principal rooms. The light and flowing accommodation provides a combination of modern open plan living areas with traditional design. The thoughtfully arranged ground floor reception areas include a sizeable open plan sitting/dining room. This charming room is flooded with natural light from the dual aspect, south facing sash windows. There is ample space for a sizeable seating area centred around the open fireplace with further space for a substantial dining area beyond. Adjoining the sitting room is the stylishly appointed kitchen. There is plentiful storage in attractive wall and base units topped with solid wood work surfaces and integrated quality appliances. A stable door leads to the privately owned courtyard. Completing the ground floor is a useful utility/cloakroom. The entrance hall is a wonderful size with an elegant sweeping staircase leading to the first floor. On the first floor there are three generous double bedrooms. The grand landing itself is somewhat of a feature with a stunning stain glass window framing the stairwell. Each bedroom is a wonderful size, the master bedroom has a pretty feature fireplace and stunning oversize bay window and could easily be used as an additional reception room. The bedrooms are serviced by a modern well-appointed family bathroom. We thoroughly recommend an internal inspection at your earliest opportunity to appreciate the size and quality of accommodation on offer. The property is situated within a discreet, exclusive collection of homes within the centre of the desirable town of Wilton. Wilton has a range of amenities within a short level walk including shops and supermarkets, churches, public houses, hotel, two doctors' surgery and community centre. There are also good local schools and a regular bus service to the City of Salisbury approximately three miles away. Salisbury has further facilities including shops and supermarkets, leisure facilities, a cinema and playhouse, further excellent primary and secondary schools and a main line railway station with connections to London Waterloo. The home is situated in a private enclave of homes that are accessed via an original gated entrance way. There is a state of the art security entry system allowing access to the homes. You are then greeted by a stunning walled oasis. There is a communal garden area with architecturally landscaped lawns with box hedge borders and abundant herbaceous and floral beds. There is a tranquil seating area and a pergola. The home itself is accessed through a communal entrance way. The home has a privately owned paved courtyard ideal for al-fresco dining. Leasehold - 997 years. The seller has informed us that the Ground Rent and Service Charge for the property is £2,200 per annum.